deepsouthsports.net: More "Far East" than "Deep South"
...but impressive none the less. The more I watch Japanese TV, the more I realize why they are a world power. These people just don't give a sh*t. They certainly "ain't skeerd" as we say in this more civilized nation. 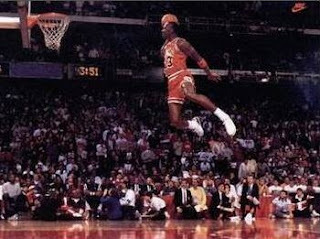 You think Jordan's foul line dunk was impressive? This little Asian dude dunks from like 25 feet out... and he doesn't even get a running start. Of course he does have a trampoline, but still...You'd break your face and pull a hammy getting on the damn thing. Despite the dunk, my favorite Pacific Theater "sports" show still goes to Ninja Warrior. It falls under the category of "shows guys get to watch when their wife's in the shower or cleaning or otherwise not in the room." I'd have to throw in MXC (Most Extreme Elimination Challenge). How can you not like the Captain with "Git it on!" ? Even though I like to cook (mainly because I like food so much), Iron Chef has gotten just downright stupid. I agree with you about MXC...i'm a big fan of Asians doing big, stupid, elaborate stunts.